Friday afternoon, an Adair County man was flown to the University of Kentucky hospital following a two vehicle collision that occurred on Hwy. 55. 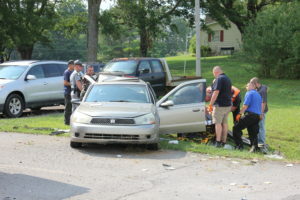 Around 4 p.m. Columbia Police Department were dispatched to the 2000 block of Campbellsville Road to a reported two vehicle collision with injuries. Preliminary investigation indicates that Christopher Cook, 38, of Taylor County was traveling south on KY Hwy. 55 in a 1998 Grand Jeep Cherokee when he struck a 2003 Saturn operated by 57-year-old Randell Wheat of Adair County in the rear of vehicle. Wheat was in traffic that had slowed for a farm implement on the roadway. Cook failed to see traffic had slowed and was unable to slow or stop his vehicle. The collision sent the 2003 Saturn off the roadway overturning once before it came to rest. Wheat was treated on scene by Adair County EMS and was transported to TJ Health of Columbia. Wheat was then flown by PHI Air Medical services to the University of Kentucky for head trauma related injuries . The collision is being investigated by CPD Officer Josh Brockman who was assisted by Ofc. John Dial, Deputy Sheriff Justin Cross and KSP Trooper Chase Willis. Cell phone usage is believed to be a contributing factor in the collision and Cook, who was not injured, was charged for operating a vehicle on an expired license and no insurance .